I have so few vices left, really. Sure, I like coffee and butter and the occasional glass (or four) of wine, but that's not exactly lounging around in an opium den, now, is it? But the one thing that's bad for me that I can't give up is the sun. I mean, how could something bad for you feel so good? Nothing sets my mind at ease, gets my endorphins flowing, and makes me feel that all is right with the world the way a good sunbath does. And, maybe it's my California roots showing, but I truly believe that everyone looks better with a little bit of a tan. Yes, even you, Nicole Kidman. However, since I have no plans to jet off to Aruba in the near future, and Jack Frost doesn't seem to be getting the memo ("Dear Jack, SCRAM. Regards, Lily"), it seems artificial tanning methods will have to suffice until the real sun comes out. 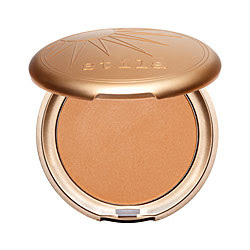 But fear not, I am not about to direct you to Lindsay Lohan's new line of fake tanners, to turn you into a walking tangerine, but to something a little more subtle: my friend, Stila Sun Bronzing Powder ($24) in Shade 2. Just brush a little of this good stuff over your cheekbones and the bridge of your nose, along your forehead and a little on your chin and jawbone- essentially think of everywhere the sun naturally hits your face when it's out (if your memory is able to reach that far back in time). It won't make you look like you just got back from Jamaica ( if that's the look you're going for, I suggest putting cornrows and beads in your hair, instead), but it will give you a glowing-from-within radiance. And, yes, it has SPF 15 in it, for you goody two-shoeses. So, can we have that summer glow now? Yes, we tan! When is it okay for men to use fake tanner or bronzing products?